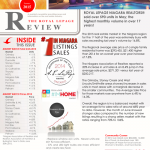 ROYAL LEPAGE NIAGARA REALTORS® sold over 590 units in May; the highest monthly volume in over 17 years! The 2015 real estate market in the Niagara region for the 1st half of the year was extremely busy with sales exceeding last year’s volume by 16.8%. The Regional average sale price of a single family residential home was $293,435, $21,400 higher than 2014 for an overall year over year increase of 7.8%. The Niagara Association of Realtors reported a 20% increase in unit sales & an 8.4% jump in the average sale price, $271,201 versus last year at $250,217. The Grimsby, Stoney Creek and West Lincoln/Smithville areas showed increases in sales units in most areas with a marginal decrease in the smaller communities. The Average Sale Price for those markets rose anywhere from 6.4% to 16.3%. Overall, the region is in a balanced market with an average list to sales ratio of around 68% year to date. However, the month of June showed stronger sales compared to the number of new listings resulting in a strong sellers market with the ratios ranging from 70% to 106%.